Osness, a resident of Thorsby and business owner of Alberta Fire Gear Cleaning, said the problem started when he spoke out as a business owner on behalf of other business owners. “I spoke up for two businesses in the Village (Thorsby) Office lobby. They agreed with our concerns. I was invited to a meeting of staff and managers and a week later, I was fired. I have absolutely no idea what is going on. Robins then went to the fire hall and rudely spoke to the men. They stuck up for me.” And in a show of solidarity, they resigned. 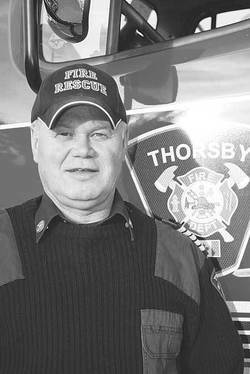 Digging deeper, could Osness have been infringing on some Fire Department policy or in breach of Village of Thorsby policy when he expressed his opinion wearing his business owner’s hat? When he became Fire Chief, was he required to take an oath to refrain from publicly disagreeing with any administrative stand? “No! There are no rules, no oaths, nothing. I wish they had told me the rules. In fact, twelve years ago, we made rules for the fire department—dress codes, how to address people at an accident scene, responsibilities…” etc. Osness looked at the whole picture while developing that policy. He was concerned for the families of the firefighters under his watch, so he had the spouses sign a document explaining what being married to a firefighter was all about and they had to be on board.